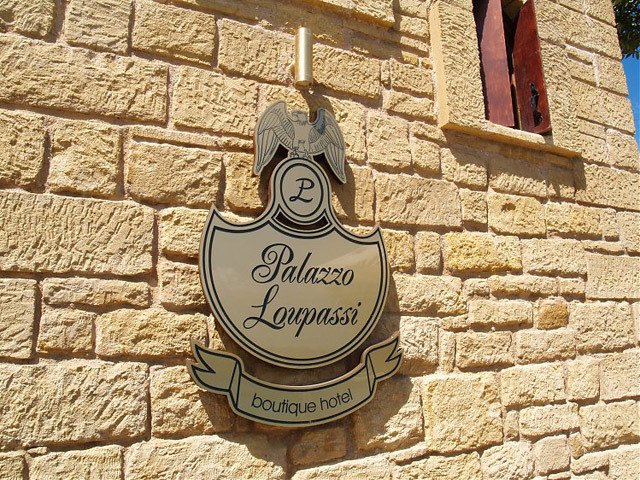 If you are seeking a special and unique place for your holidays, a place which will take you back to the times of princesses and kings, equipped, however, with modern amenities, you may visit "Palazzo Loupassi" Boutique Hotel. 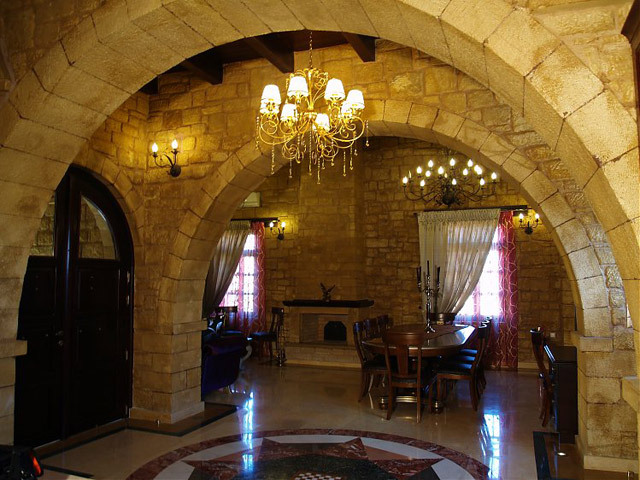 A carved, stone castle, surrounded by age-old olive groves and vineyards, gorges and Byzantine churches. For those who would like to relax at the hotel with their family and their friends, the swimming pool, Barazzo Bar and Barazzo Café are at their disposal… besides all these, Palazzo offers two sheltered barbeque places with a grate, a wood oven, and a fireplace hearth along with whatever is needed for unforgettable … wine-tasting!!! Moreover, we would like to inform you that by the summer 2011, Palazzo Loupassi will feature the SPA & FITNESS CENTER of the complex, for moments of relaxation and well-being through various treatments as well as the “LABIRYNTH” CONFERENCE CENTER, with a seating capacity of 185 persons for conferences and your events. 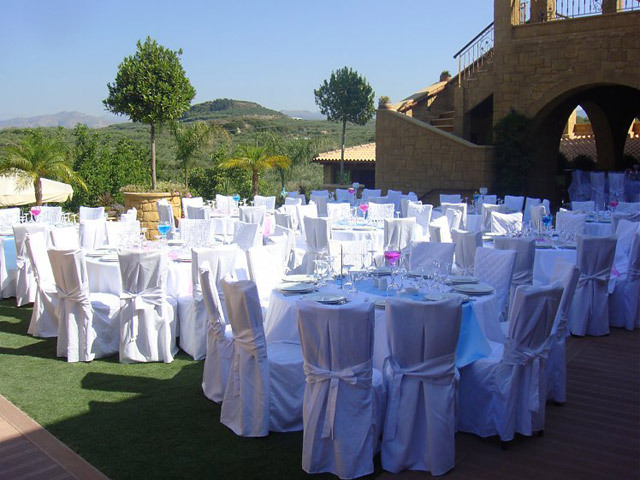 Palazzo Loupassi is the ideal choice for the most beautiful moments of your life. 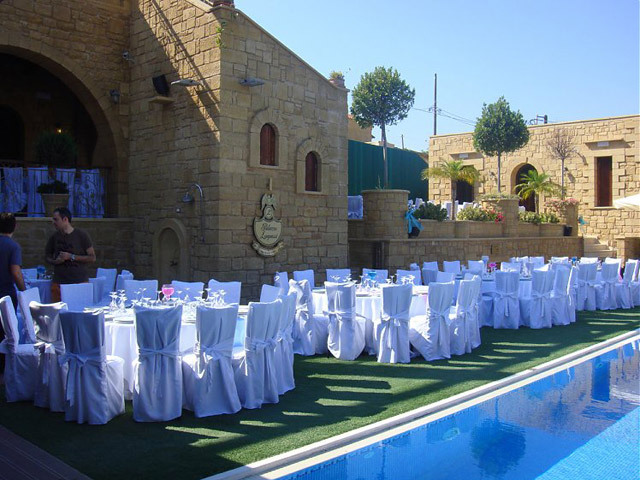 We organize any type of social event in the unique venues of our hotel, paying attention to quality and luxury, ensuring that your event will be engraved on your memory as well as on the memory of your selected guests. 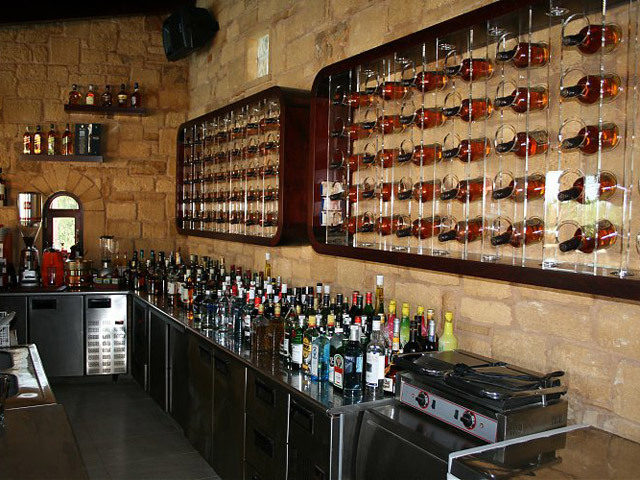 The Palazzo Loupassi offers the unique Lounge Bar Barazzo with one of the most complete drink collections! 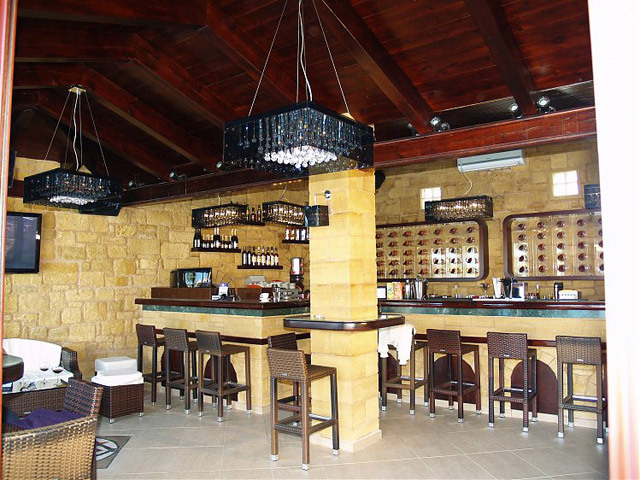 You can enjoy the bar and the music from early in the morning, with your fresh juice or cafe or ice cream till late in the night with a drink! Opposite to the bar, there is an area for those who want to relax. Palazzo Loupassi has a unique stone built wine cellars with more than 100 labels of the best wines in the world! If you get confused by the Palazzo Loupassi sommelier will help you choose the right wine that will satisfy you completely. Just opposite of the Palazzo Loupassi operates a traditional "temple of taste" with exquisite dishes. 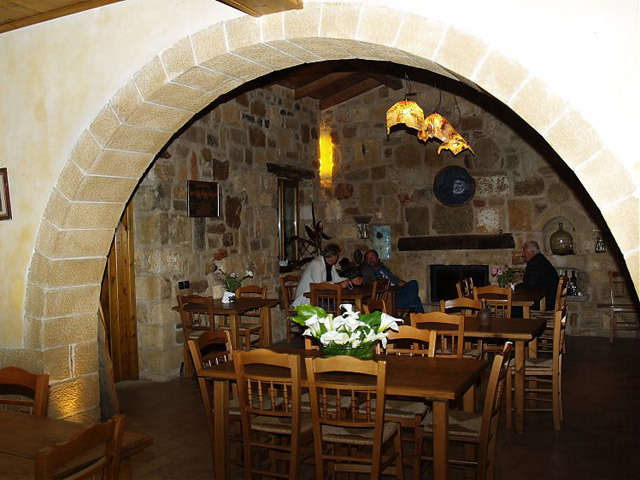 Taste the traditional Cretan cuisine and international cuisine from award winning chef Anthi Agorastakis. 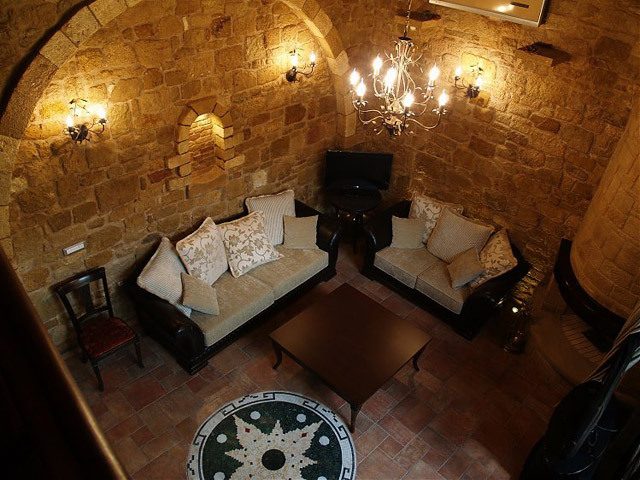 You may choose from royal suites, two-storey rooms with a fireplace or traditional attic rooms for your accommodation and travel to the past. 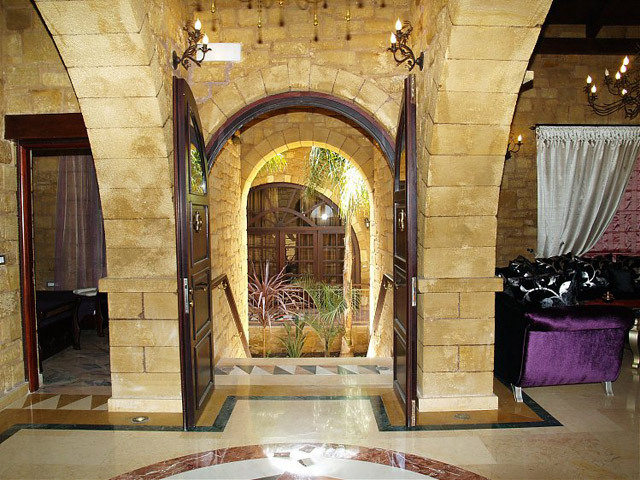 In the PRINCE ELIAS PRESIDENTIAL SUITE (170 sq m), a truly special place awaits you. 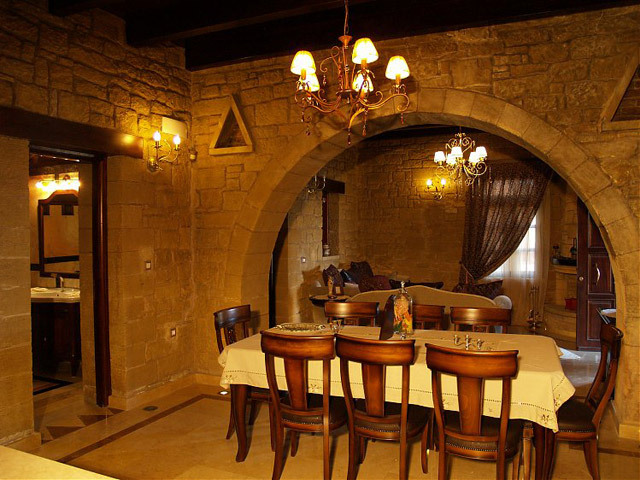 Its majestic arches, its tall stone fireplace in the living room- for romantic moments- and its dining room seating 14 people will certainly make you feel like a prince. 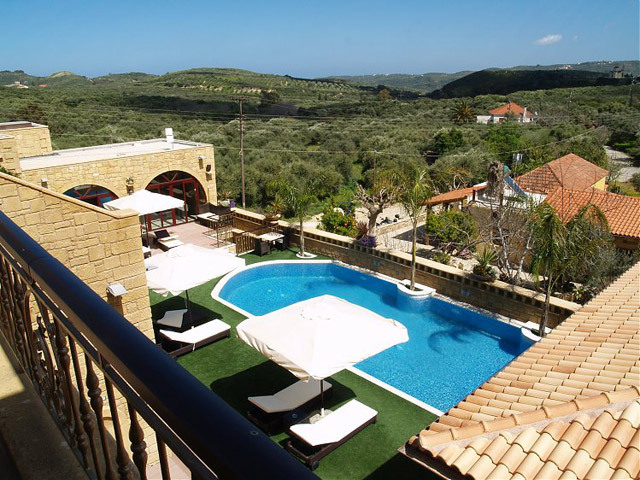 It is fully equipped with a kitchen, including a fridge-freezer, a dishwasher, a washing machine, ceramic hobs and an oven, a coffee-maker, a built-in ironing board and an iron, cookware and serving pots, made of fine china. 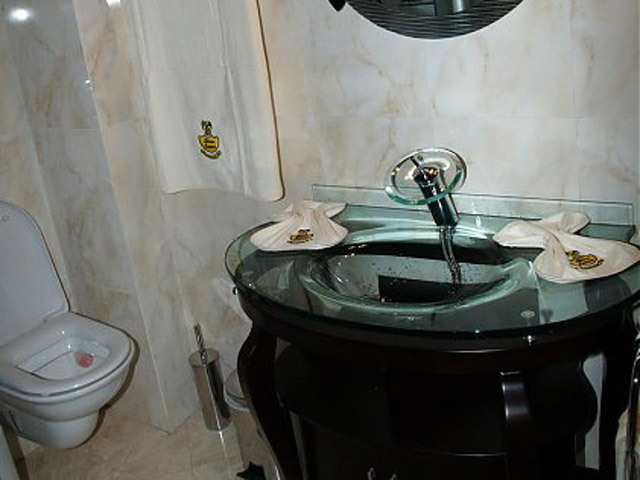 It includes two aristocratic marble whirlpool baths and hot water around the clock, a hair dryer, DALL self-cleaning system and precision scales. The 3 luxury bedrooms (two with double beds and one with twin ones) feature hand-crafted furniture, ecological Cocomat mattresses, big wardrobes, an in-room safe, a telephone, a satellite flat TFT TV set and a DVD player while there are bathrobes, slippers and high-quality Palazzo Loupassi towels provided along with other necessity items. Finally, the living room of the Prince Elias Presidential Suite is decorated with hand-crafted furniture of high standards, a big, flat satellite TFT TV set, a computer with WI-FI connection and Internet access, a landline with direct external access, a DVD player (home cinema) and a play station3. 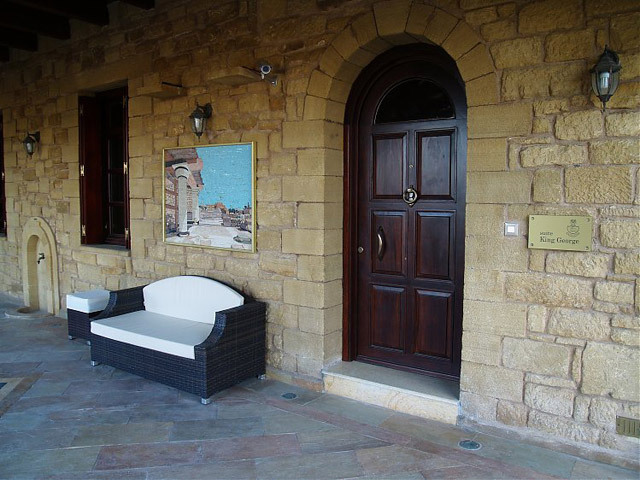 All rooms have marble floors of high standards, unique handmade chandeliers, individually-controlled air-conditioner, an inverter, a heat-cold ionizer, while the suite is protected by an independent high quality security alarm. 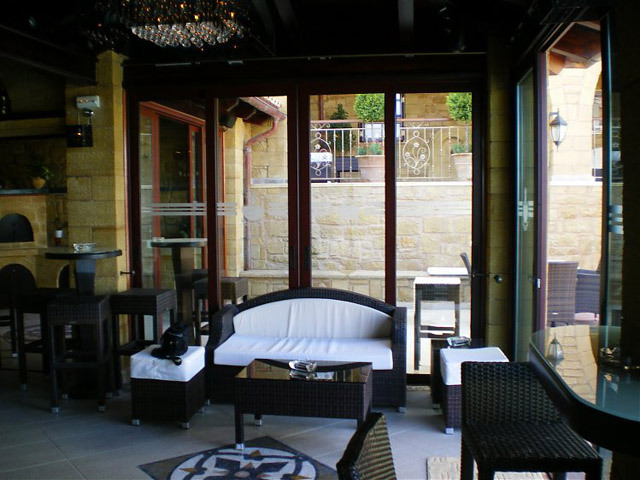 The spacious veranda is ideal to gaze the PL surroundings as well as the swimming pool and its lush environment. Breakfast is served at the suite’s dining room. 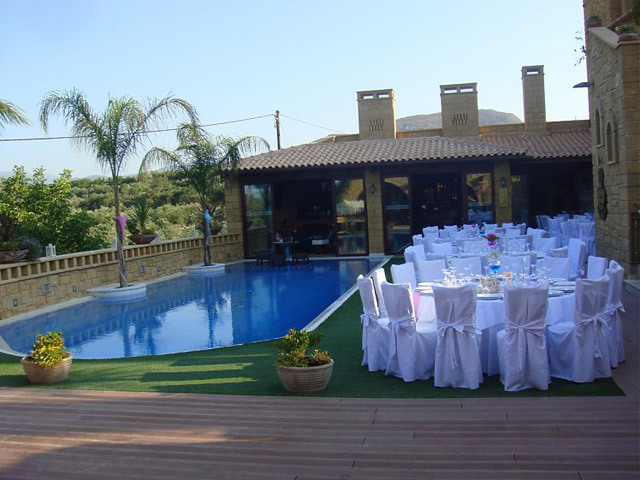 Use of the swimming pool with a set of sun loungers and a sun umbrella as well as Palazzo Loupassi pool towels. 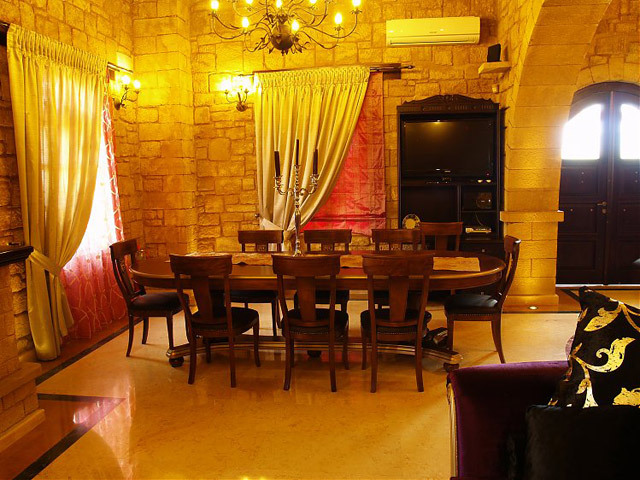 In the unique KING GEORGE GRAND SUITE (100 sq m), you will realise the importance of luxury in a cosy place with a beautiful atmosphere and many amenities for wonderful moments with your family or your friends. 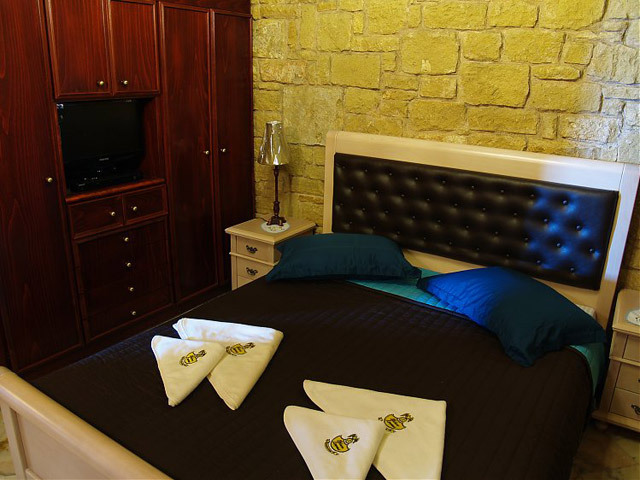 You are expected to find two luxury bedrooms (with two double beds) including hand-crafted furniture, ecological mattresses Cocomat, big wardrobes, an in-room safe, a heat/cool air conditioner and an ionizer, TFT TV sets and a DVD player for the moments you want to feel at home. 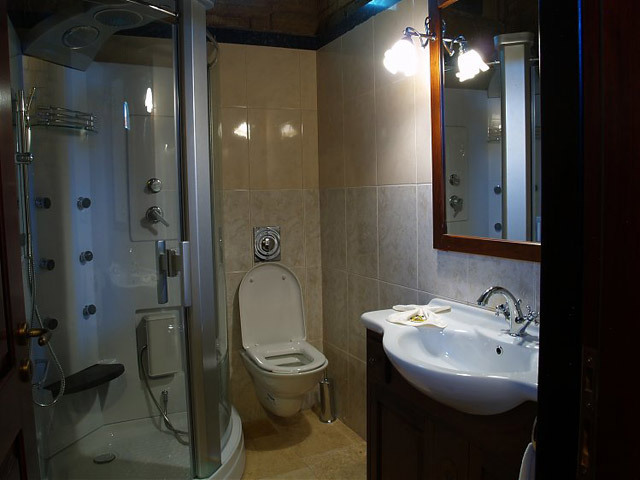 You will also be provided with bathrobes, slippers and high quality towels, especially designed for Palazzo Loupassi. 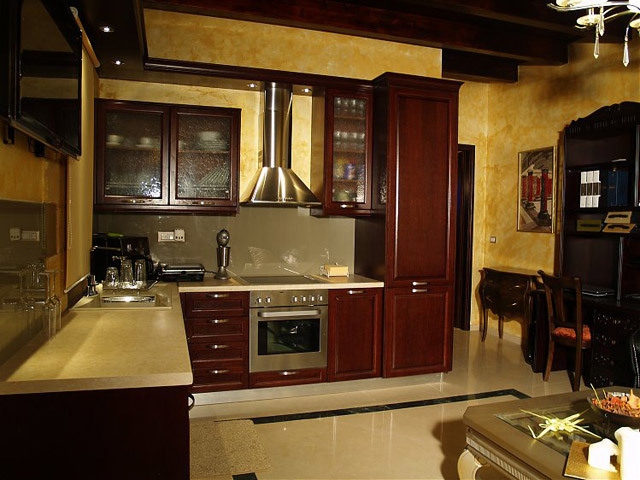 The suite features a fully-equipped kitchen with all the necessary electrical appliances, such as a fridge-freezer, a dishwasher, a washing machine, ceramic hobs and an oven, a coffeemaker, a built-in ironing board, an iron, cookware and serving pots made of fine china. In the dining room and living room, you will find a stone, ecological fireplace, a hand-crafted dining table seating 8-10 people, a big TFT TV set, a DVD player (home cinema), a laptop with WI-FI connection and access to the Internet, a telephone with direct external line, a PlayStation 3 and whatever else you may need for a comfortable and pleasant stay. You will also find an aristocratic bath of fine marble, a whirlpool bath with hot water provided around the clock, color therapy, aromatherapy, a hairdryer, scales and many other amenities. 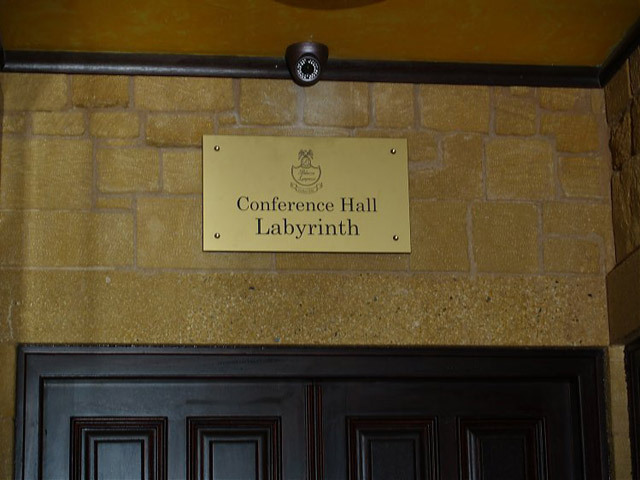 All the rooms have high standards marble floors, unique handmade chandeliers, individually controlled heat/cool air conditioners-inverters with an ionizer, while the suite is protected by a high security alarm system. The spacious veranda of the King George Grand Suite is ideal for the relaxation of you and your friends and a place where you can gaze the swimming pool and the remaining facilities of Palazzo as well as the wonderful surroundings. In the PRINCESS ELEFTHERIA EXECUTIVE SUITE, you will enjoy the peace of an independent suite where you may experience moments from another time. The two-storey suite features a bedroom with a double bed and hand-crafted furniture in the attic, an ecological matress Cocomat, a wardrobe, an in-room safe, a heat/cool air conditioner-ionizer producing oxygen. 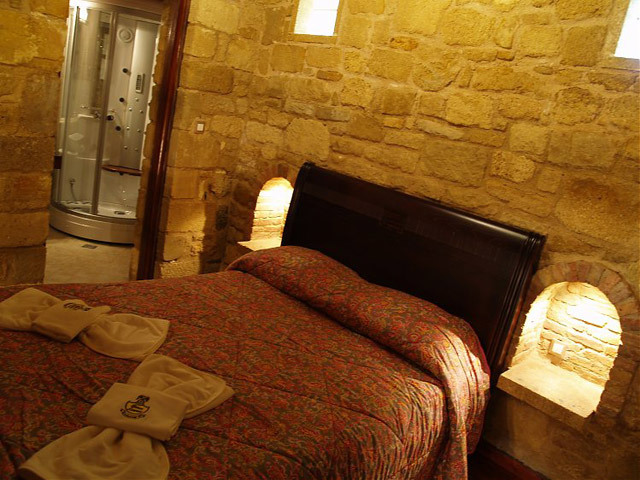 There are also bathrobes, slippers and high quality Palazzo Loupassi towels provided. 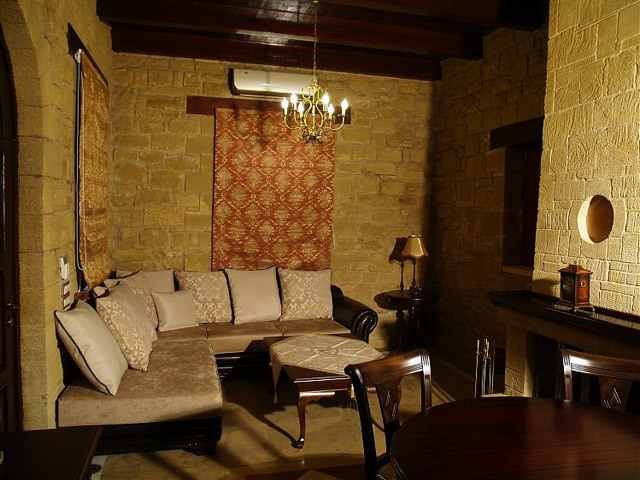 The drawing room features a majestic, ecological, stone fireplace, a handmade dining table seating 5 persons, a big TFT TV set, a DVD PLAYER (home cinema), a laptop with WI-FI connection and access to the Internet, a PlayStation 3, etc. 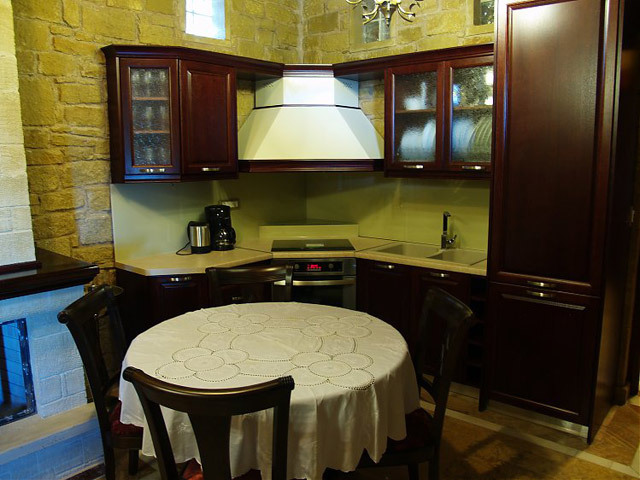 The kitchen is fully-furnished, having all household appliances such as a refridgerator (fridge-freezer), a dishwasher, ceramic hobs and an oven, a coffeemaker, an ironing board and an iron, cookware and serving pots made of fine china. 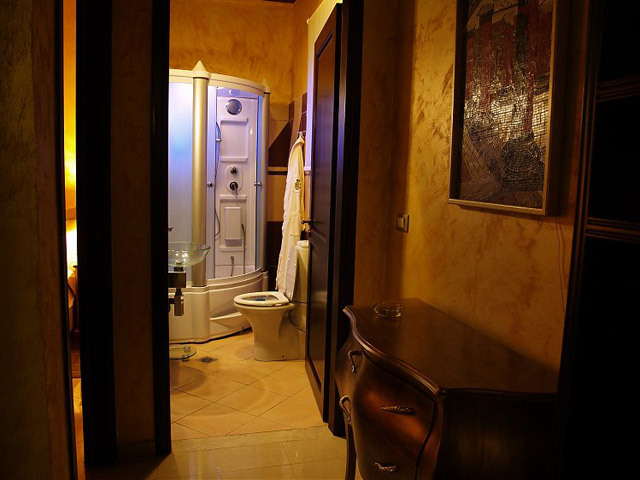 Finally, there are two bathrooms with a whirlpool cabin, hot water around the clock and ozone therapy in one of them. Both bathrooms are also provided with a hairdryer and digital scales. In the main area of the suite, you may marvel at the exceptional mosaic, which will travel you back to another era, while you will find unique hand-crafted chandeliers, a heat\cool airconditioner-ionizer in all the rooms as well as complete protection with an independent high-security alarm. 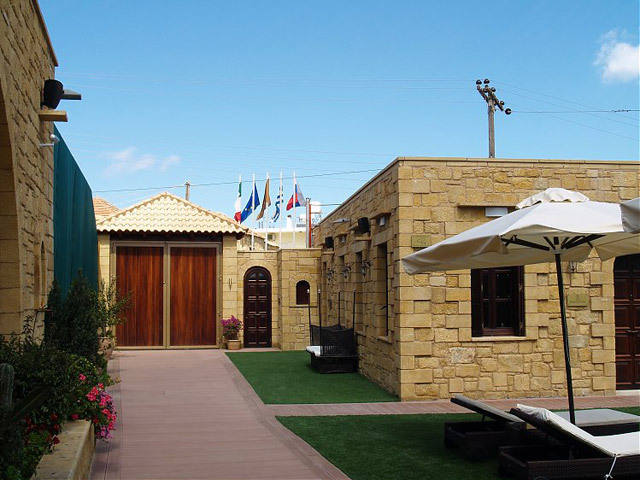 There is also a courtyard with its own barbeque for the residents of the PRINCESS ELEFTHERIA EXECUTIVE SUITE. Breakfast is served at the suite's dining room. 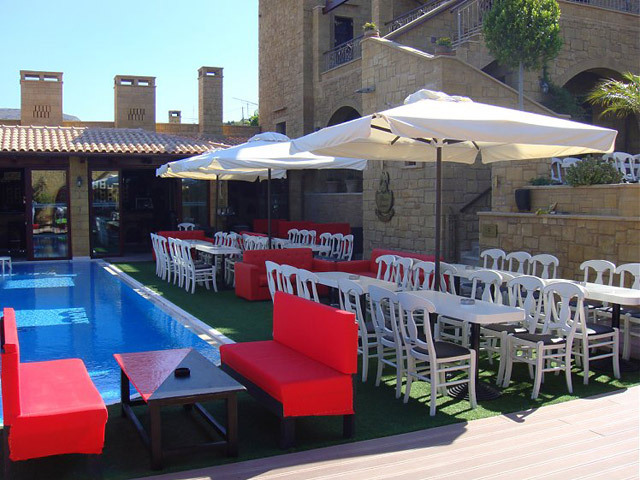 Use of the swimming pool with a set of luxury sun loungers and a sun umbrella as well as Palazzo Loupassi pool towels. In the QUEEN ANGELA JUNIOR SUITE, you may relax in a luxurious, cozy and functional place tailored to meet every single need. 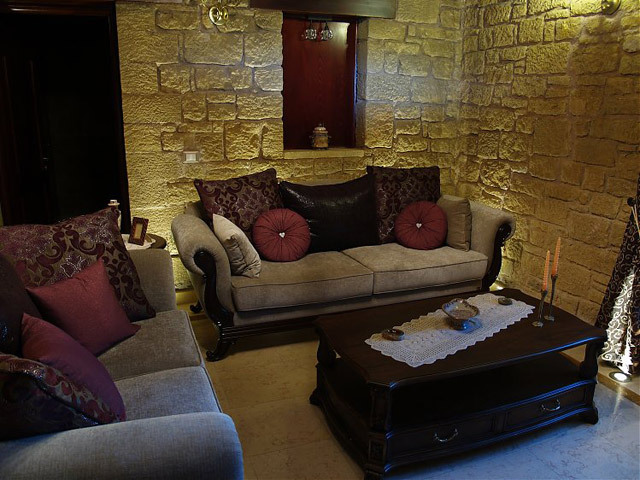 Here you will find a living room and a dining room seating 4-5 people with a stone ecological fireplace, hand-crafted furniture, a big TFT TV set, a DVD player (home cinema), a laptop with WI-FI connection and Internet access, a PlayStation 3, etc. A fully-equipped kitchen with a fridge-freezer, ceramic hobs and an oven, a coffeemaker, a built-in ironing board and an iron, cookware and serving pots made of fine china. A bathroom with Murano crystal and a whirlpool cabin with around the clock hot water, color therapy, aromatherapy etc., a hairdryer and digital scales. Finally, a bedroom with a double bed with an ecological mattress Cocomat, a wardrobe with ample room, an in-room safe, a heat/cool air conditioner and ioniser, a TFT TV set and a DVD player. 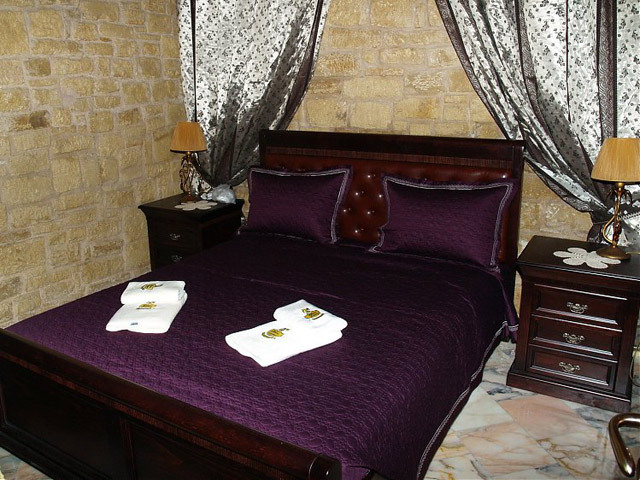 There are also bathrobes, slippers and high quality Palazzo Loupassi towels provided. 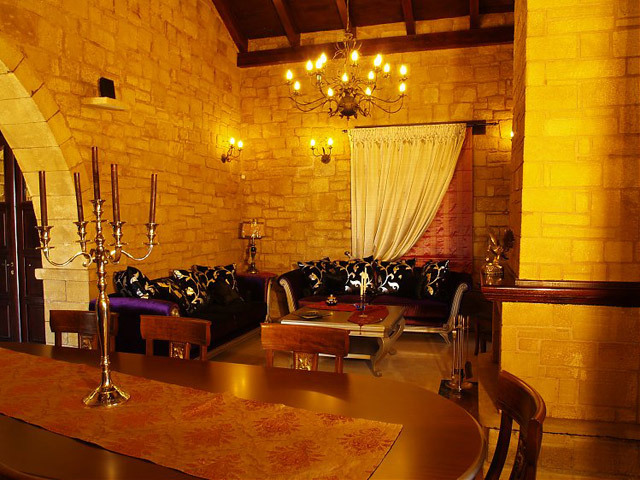 All the rooms have high standards marble floors, unique handmade chandeliers, an individually controlled heat/cool air conditioner-inverter with ionizer, while the suite is protected by an individual high security alarm. Breakfast is served at the living room of the suite. 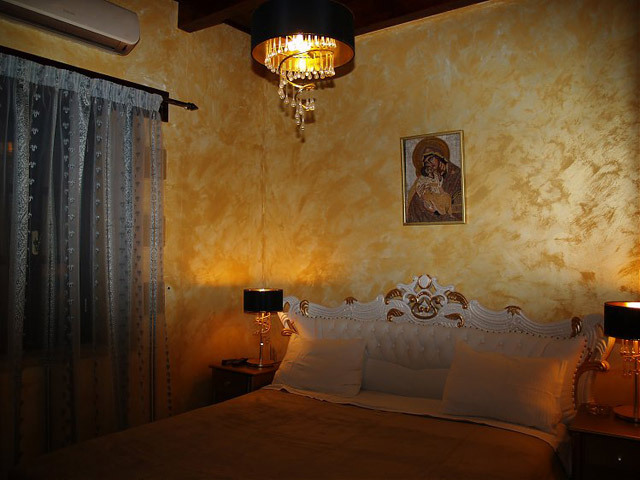 In the ARIADNE JUNIOR SUITE, you will live the experience of ... gold! 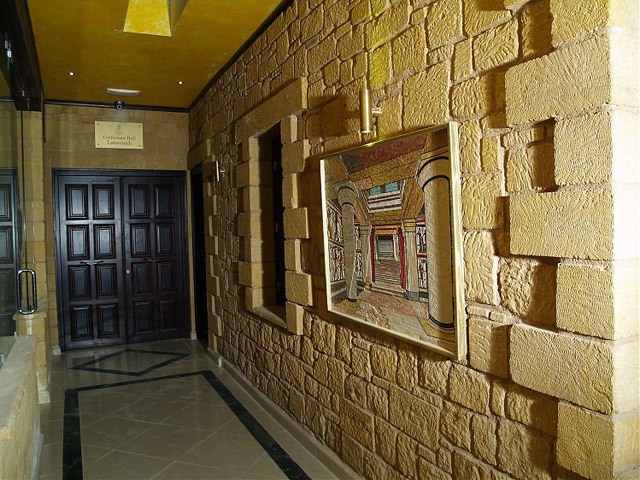 This is so since the interior of all the rooms of the ARIADNE SUITE are not only made of stone but are also painted with the style of 24 carat gold! That's what distinguishes the Ariadne suite from all the other Palazzo Loupassi suites. 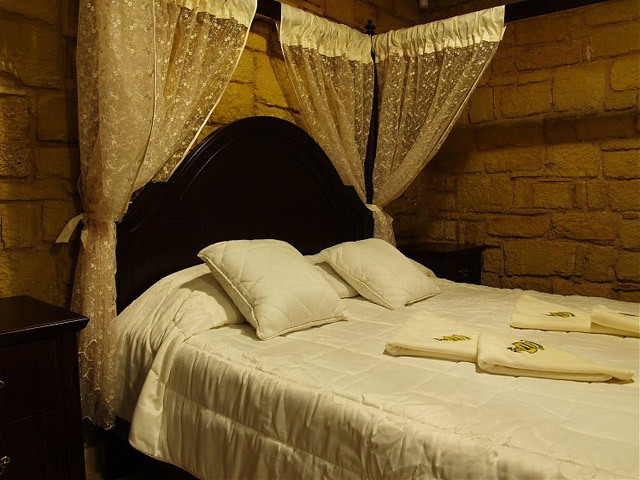 Here you will find a cozy bedroom with a king size double bed with an ecological mattress Cocomat, an ample wardrobe, an in-room safe, heat/cool air conditioner, producing oxygen and an ionizer. You will also be provided with bathrobes, slippers and high quality towels, exclusively designed for Palazzo Loupassi. A living room with hand-crafted furniture, a TFT TV set, a DVD player (home cinema), a laptop with WI-FI connection and access to the Internet, a PlayStation 3, etc. 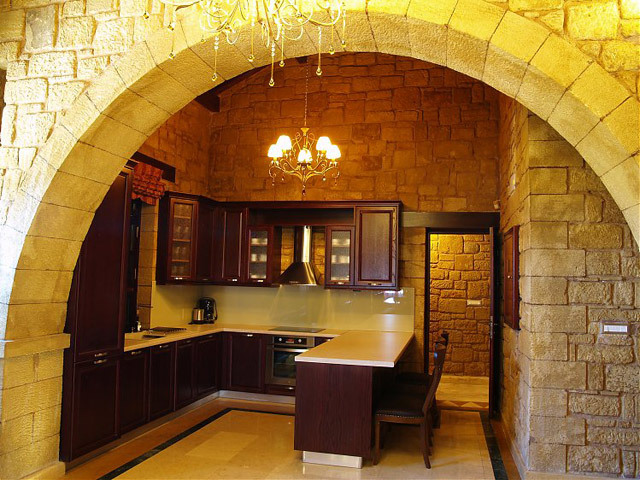 A fully-equipped kitchen with all the household appliances, such as fridge-freezer, a dishwasher, ceramic hobs and an oven, a coffee-maker, a built-in ironing board and an iron, cookware and serving pots made of fine china. Finally there is a spacious bathroom with a whirlpool cabin and hot water provided around the clock, a hair dryer and digital scales. 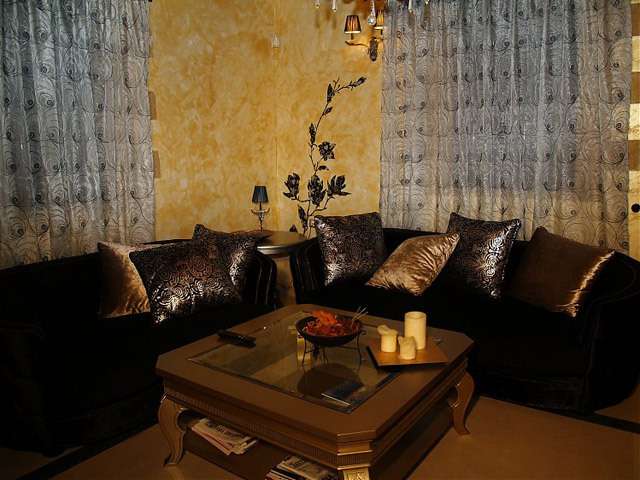 The suite features unique handmade chandeliers, an individually controlled air conditioner-inverter with an ionizer, while the suite is protected by an individual high security alarm. Breakfast is served at the dining room of the suite. 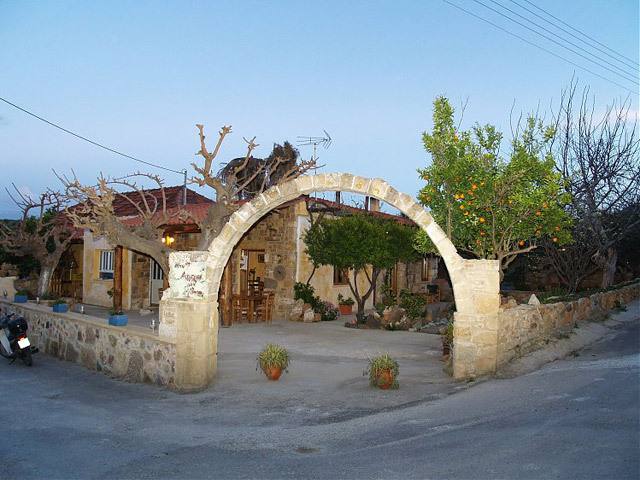 The historic Palazzo is located 30 kilometres to the west of the city of Chania, in the hamlet of Vasilopoulo-Kolymvari of Chania, Crete. 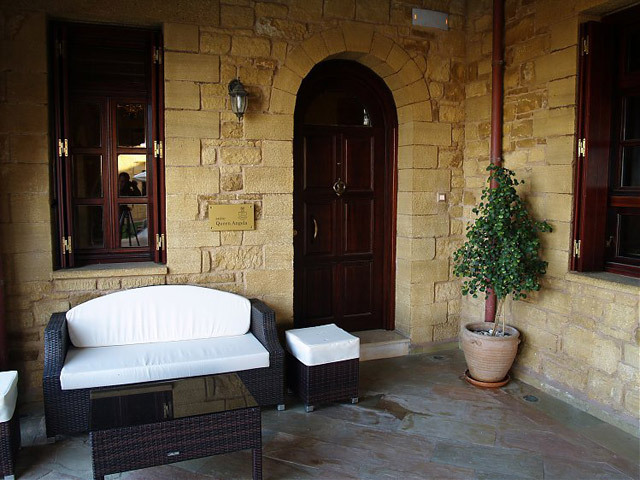 We enjoyed a very special stay in an extraordinary hotel, surrounded by olive trees and very calmful countyside atmosphere, and this just 10 minutes from the mediterranean sea. 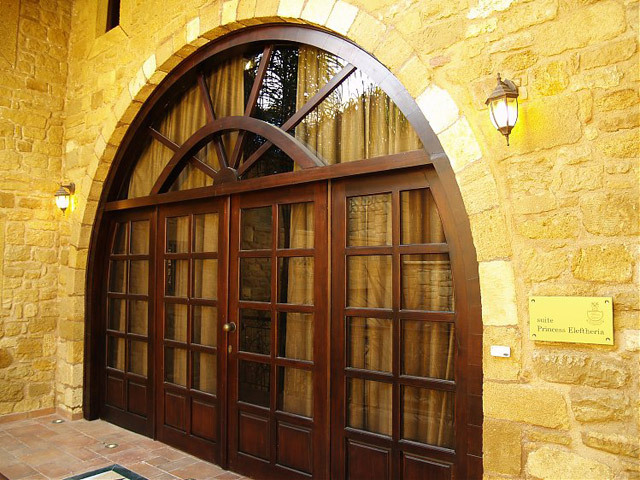 The fact that only 5 suites are offered in this hotel full of details, makes it very special and enjoyable. We felt almost part of the owner's family who always made recommendations for enriching our stay. We spent 3 weeks and felt as being at home. Special thanks to Georgios, Angela, Elias and Eleftheria. 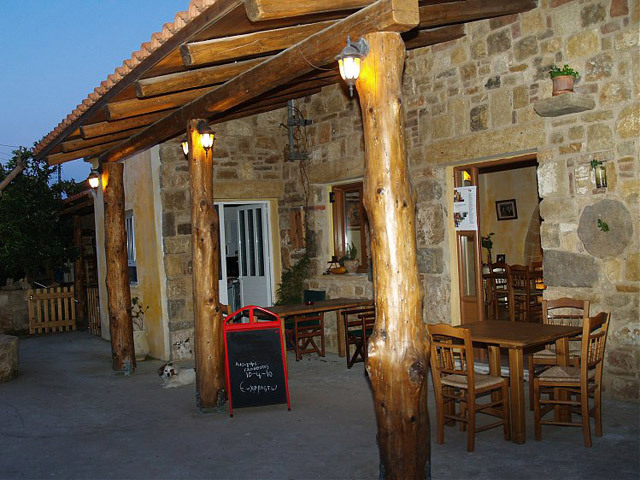 Additional recommendation for guests: the restaurant just in front is a must! Open: Year Round..... 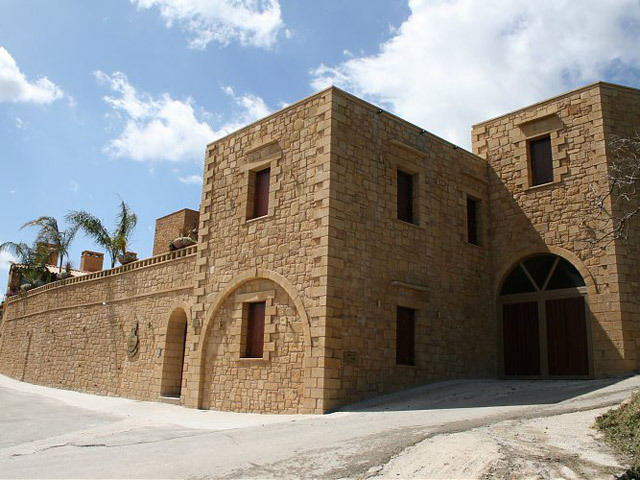 The old manor of the Loupassi family was restored and expanded with a great zest, resulting in a rambling form which consists of steps, arches and lanes with courtyards. All the above combined with its prime location make up a unique place.